At HTC’s Vive Developer Conference, the company finally got to show off its upcoming standalone headset to the Beijing crowd – the Vive Focus. Designed to be an all-in-one device, the Focus won’t need to be hooked up to a powerful desktop PC in order to run and won’t have the same interactivity constraints that mobile VR currently has. Instead, the unit intends to tread the lines between power, portability, and affordability, which puts it in competition with some recently announced Oculus headsets, in particular the Project Santa Cruz and the more affordable Oculus Go. The headset will feature an AMOLED display and is powered by a Qualcomm Snapdragon 835 CPU, capable of “world-scale” tracking – the name HTC is giving to its inside-out 6DoF (six degrees of freedom) tracking. This allows for detecting three-dimensional movement and rotation in any environment, with no need for additional external sensors. Touted at Google IO 2017 as being one of the first standalone Google Daydream headsets that doesn't rely on a phone for power, Google VR's Clay Bavor has confirmed that the Vive Focus won't be coming to the platform, but instead will run on its own software. 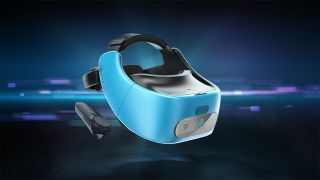 The Vive Focus hasn’t been given any official launch date or pricing, but it’s safe to assume that it'll be available in China before going global. Alongside this announcement, HTC also unleashed its new VR development platform, which will be utilised by the Focus. The company hopes that Vive Wave will “bring together the highly fragmented mobile VR market” by make device optimisation and content creation easier for third-party developers. With 12 third-party hardware partners already supporting the platform, and over 35 developers already creating content for it, Wave’s future is looking bright… at least in China. While a lot of the presentation did reference China-specific goals, the likelihood of these developments eventually reaching the global audience is good.